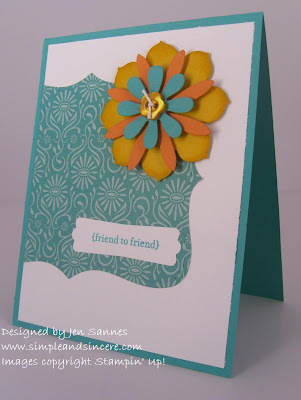 I'm combining two challenges with this card - this week's CAS challenge, which is to use turquoise, orange and yellow on a card, and Fall-to-Layout #51. I'm having LOTS of fun playing with all of my new goodies. I can't wait to break into some more of my new dies and stamps, but this is a busy week, so we'll see how much time I have to play. I love this layout - very simple, and full of possibilities. 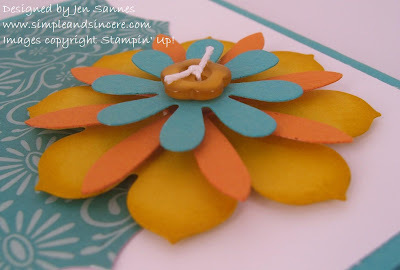 Here you can see a close-up of the flower embellishment, which I made using the new Blossom Party Originals Die (a SU! exclusive die). I sponged a little Crushed Curry ink around the edges of the largest flower, and layered the Pumpkin Pie and Bermuda Bay flowers on top. I added a button from the Playground collection of Designer Buttons. I like the look of the Thoroughly Modern dsp with the Top Note die. What a fun, tropical card, eh?